Mexican wolves live in Mexico through Texas and New Mexico.Their length is from 3.9-4.9 inches, They about the size of a german shepard dog.they eat white tailed and mule deer,elk, pronghorn, antelope, javelina, beaver, and other small mammals. they live in temparate deciduous forests.The last remaining red wolves live in coastal rairie and marsh areas. 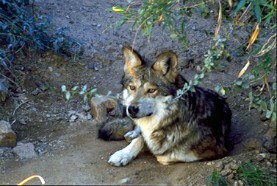 At present, the red wolf is ixtinct from the wild. Red wolves eat white-tailed deer and raccoon, but will eat any available small animal. Today the red wolf population is at 300 captive animals in zoos and captive breeding facilities. Their height is from 25-31 inches, And length is 3-5 feet.Their diet is mainly artic hares, mush ox, caribou, and lemmings. They usually live in tundras, rolling hills, glacier valleys, ice fields, shallow lakes and green flats. They can live in places where it is contantly below zero and the ground is always frozen. Their hieght is 36-33 inches, and length is 6.5 feet.They eat small animal and birds. When in packs, They eat sheep and other large animals.Found in various parts of north america, Europe, And Asia. In the US they range from rocky mountian ranges to areas in the great lake states. They can be found in prairies and forests, But usually not of high mountain ranges because of lack of food. Their long legs help them see better in tall grass. 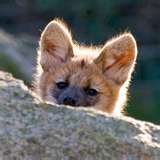 The maned wolf lives in south america-Northern Argentina, peruguay, Eastern Bolivia, And Southeastern Peru. They live in tropical savannahs and tropical scrub forest. maned wolves are omnivores(eat both plant and animal), They prefer lobeira(tomato like fruit) and small mammals like rodents and chickens.